No day is the same. Each day presents new issues, discoveries, challenges, and satisfaction when a project is completed. It is hard to explain, and, really, I am even reluctant to try and explain a most peculiar phenomenon. You see, whenever I arrive at the Cross House, no matter that I might have had a difficult day, and arrive tense and overwhelmed, within like five minutes after stepping into the house I feel better. Indeed, I feel happy. And calm. It is as if the house, somehow, is like an IV drip of valium going straight into my veins. The effect is quite extraordinary, and consistent. In short, when I am at the Cross House I feel good. As such, I want to be at the Cross House ALL THE TIME but my lighting business precludes fully acting upon this yearning. Poo. As I worked till very late the previous night finishing the restoration of two light fixtures, and got them packed with FedEx labels affixed, I was able to spend most of the day at the Cross House for, you know, my fix (see above). I arrived early, and spent a while with one of my guys in a somewhat difficult conversation (argument?) about how best to remove 120-years of paint splatters from the gorgeous limestone foundation walls. Although we arrived at no definitive conclusions I am pleased to announce that no one was killed. Mike then arrived (he is working on the house) and we discussed his starting to clean up the basement walls as I had a recent brainstorm about converting the basement into a cool steam-punk/Hollywood-Regency apartment so that the house, instead of remaining vacant until the upper levels are finished enough for me to move in, might have a living presence in the house (helping to protect it). Then I walked up two flights to my own work station. This is in the “octagon” bedroom, so named because it has a delicious octagon bay to one side. I have a 4-foot x 8-foot worktable (a piece of plywood on four legs) set into the middle of the room. Having a good worktable, and of a good size, is vital IMO when restoring a house. In the basement we have, too, a 4-foot wide x 16-foot long table. Yep, S I X T E E N feet. Every guy who tours the house looks longingly and lustfully at this long slab of manly workness. I set to work on yet another window sash from the upper-most reaches of the round tower. There are five windows way up there, comprising ten sashes total. Never in all recorded history have there ever been sashes which looked SO bad as these ten miserable specimens did. My God. Because the sashes are WAY up in the air, they, not surprisingly, received little attention during the last 120-years. Well, I should clarify that. While they received little EXTERIOR attention they did receive a great deal of INTERIOR attention. And none of this attention was good. The windows obviously allowed air to blow freely into the top level, and it is also obvious that decades and decades of freezing top-level residents tried anything and everything to seal the damn windows. So, I encountered copious amount of caulk dating back to before I was born, massive amounts of glue (now petrified), old rags interspersed with glue/caulk, old toilet paper interspersed with glue/caulk, and some sort of rock-hard reddish resin wholly unidentifiable but likely from the planet Krypton (as no such substance could possibly be of Earth), which we had to chisel off (I kid you not). Then, there were also layers and layers of paint globbed on all this. Oh, and the glass was impressively dirty. The sashes seemed certain candidates for the dumpster, but….but…when you own a house on the National Register of Historic Places you cannot be casual about tossing original bits away. Plus, well, I, ah, umm, get…excited about this kind of challenge. And what a challenge! I mean, what a thrill if these horrible, disgusting, and disturbing bits could be returned to their original condition. The satisfaction would be great indeed. So, after John laboriously got the wood into a condition which could, no doubt, be presented to The Queen without even a hint of embarrassment or social faux pax, I could reset the old glass and commence with glazing. This is a bit of an art and I will have a later thread on the subject. Suffice to state for now that this morning I happily glazed a sash in my lovely octagon-bayed workroom all the while humming away and trying to keep my full weight off my right leg. There is something deeply satisfying about glazing correctly. When I finished and looked at four perfect beveled corners — I know, I should not brag — my satisfaction was great indeed. Yes, it is not like like I built a rocket to the moon, or cured cancer, but I will happily receive satisfaction wherever I find it. Scott then arrived, and I hobbled to the main floor to consult about the stained-glass windows which Scott will be, hopefully, restoring in 2015. Because the house has forty such windows, and because they are in desperate need, I hope Scott does not notice when I look at him with abject adoration and yearning in my eyes, for he can create magic with my windows. Come to think of it, Scott is likely well used to being so adored as he goes all over Kansas and other places creating magic with colorful, intricate, and bejeweled works of art. Scott was there to develop estimates for restoring all the stained-glass windows (causing me, briefly, to look at him with fear rather than adoration and yearning) and to drop off two small square pieces of beveled glass. The double front doors have dozens and dozens of such pieces but one, while still in place, had been shattered a very long time ago. In order to recreate it, Scott needed an intact piece. So one was gently removed and reverently handed over to him, and — behold! — a short while later I had two pieces in my hand. It is silly the thrill I experienced. I own this HUGE house needing a TON of work and yet holding in my hand a recreated minute bit was deeply exiting and satisfying. So, I resumed looking at Scott with great affection. The man. Then — whoee — lunchtime! I went over a few blocks to Bobby D’s BBQ downtown. I love anyplace downtown, as I have loved downtowns since I was a kid. One of the reasons I purchased the Cross House was because of its close proximity to Emporia’s main street. Since buying the house I am so often at Bobby D’s, and because I always order the same thing, that the wait staff no longer asks what I want. Moments after sitting down (and occasionally even before, if the staff is really on their toes) I have a Diet Coke placed before me. A bit later my pulled-pork arrives and French fries. Then cheesecake (and not boring cheesecake, no siree, but rather Triple Vanilla or Turtle or my favorite, Mango). Me happy (even if each such a lunch takes three weeks off my life). The wait staff, all exceedingly pleasant and attentive, seem to enjoy this ritual. I always sit alone (at the counter if the place is busy or at a table if I arrive after the lunch rush) and always bring a book. This quiet time by myself is vital for recharging my batteries and I am normally immune to all the bustle around me. Lady Gaga could walk in and I would not notice. Because I love architecture and urban planning, my book was Morningside Heights: A History of Its Architecture and Development. Morningside Heights is a really unusual part of Manhattan in New York City, a plateau overlooking the city and uniquely filled with medical, religious, and educational institutions (like Columbia University and Barnard College). You would not think that the history of the plateau’s development would be interesting, but it is. Really! I resumed glazing a sash and was enjoyed the rain-invigorated air wafting through the open window when Eric arrived. Eric and his wife Lesley own a stunning and incredible old house a block away and the house is — shriek! — designed by Charles W. Squires, who designed the Cross House. Upon first meeting Eric and Lesley I was, not surprisingly, entranced/besotted/awed by them. They were, instantly, my favorite people on Earth. Eric was there to help answer some questions about egress in case of fire (Eric is a fireman). Then he offhandedly mentioned that Jill would be happy for us to tour the Plumb House across the street. Whoee! I instantly forget about boring ol’ egress issues. The Plumb House is another miraculous survivor, and is also on the National Register of Historic Places. I will be doing a long post on the house but for now I will say that the house is luscious luscious luscious. Jill is the director, and a total delight, and the three of us ran all over the house, from basement to ballroom attic, and were like kids let loose in the proverbial candy store. Ahhhhhhhhhh. Nothing, and I mean nothing, gives me as much pleasure and excitement as running all over a fabulous old house. It is better than mango cheesecake. Crestfallen that the tour was over, I limped back across the street, but minutes after entering the Cross House I was inflated with happiness again. It happens every time. I resumed work on the window sash, finished it, and then finished a second sash. Then I went to the first floor, and installed the two small square beveled glass pieces (which Scott had left) in the front doors. Wow. I have no idea how many years, or decades, the one piece was shattered but now all was resurrected. All was once again like it was. And even though a lot of terrible things are happening across the globe, in Emporia, in Kansas, and in a very very very tiny way something was a bit better. I left around around five and as I pulled out of the driveway was aware that I felt a calm sort of joy about the day. Hey, I thought, you should write a post about it. For the first time in a very long time none of the beveled squares in the front doors are broken. Hallelujah. 18 Responses to WARNING: A very long post about my day. But it was a good day. With the apartment, I am going to try something never before attempted. Indeed, I am a little afraid such an attempt should even BE made! You see, I am going to try and marry two polar opposite aesthetics, and fear that the very attempt may rip the fabric of space/time! The basement already has a diluted sorta steam-punk thing going on. There are pipes everywhere, radiators on the ceiling, and wires, ducts, and all that one would expect in a basement. The floors are concrete. The walls are a mix of stone, brick, and concrete block, and all with an uneven patchwork of 1940s plaster over. In short, a steam-punk canvas. Over this canvas I plan to (if I figure out the egress issue) insert a Hollywood-Regency aesthetic: Gilded framed mirrors, crystal wall sconces, baroque headboards, and over the round dining table at the bottom of the round tower will be a crystal chandelier. I have no idea if anybody will be willing to rent such a surreal juxtaposition, and hope that the Gods send at least one intrepid soul who thinks: AWESOME! Ross, it sounds AWESOME to me! Let me guess…lots of jewel tone colors, velvets and/or animal prints? This intrepid soul thinks you should have no trouble finding someone who would love to live there. Can’t wait to see this masterpiece! Pictures, please. Just thinking (belatedly) that many Victorians had a Turkish Corner in their home which showcased exotic treasures accumulated from their travels abroad. It only stands to reason that a house as large as Cross House could easily sport a “Turkish Basement”! It’s a great house now. I can only imagine how grand it will be when you’re finished! Those small accomplishment, like the front door glass, are indeed satisfying. I desperately want the pumpkin orange paint off my front door, maybe next year. Travis!!!! Hello! You are, of course, a kindred spirit! And you sir, are one of our favorite people as well! Lesley! You make the top of my bald head blush! Thank you! Really very inspiring Ross! Keep up the great work! Check out the movie “Brazil” for an estimate of the look you are imagining for your basement! I can’t remember the exact scene but it is there somewhere. Ross, I’ve only recently discovered your blog and I’m afraid I’m woefully behind (but working diligently to catch up!). This fantastic description of your day is definitely my favorite so far. Brilliant! I have family in Emporia and whenever I’m in town, Bobby D’s is my favorite place to eat. Yummy cheddar bites!! I’ve driven past the Cross house numerous times and always felt admiration and a bit of jealousy towards the owner. After reading the narratives of your restoration adventures thus far, I must say there is now much more admiration and less jealousy. I can’t wait to read more. Tami, thank you for the lovely comment! I love Victorian homes. But I am safe behind my computer. I currently reside in Johnson County, Ks and have upcoming appointments at K.U. Medical Center, 3901 Rainbow Blvd, K.C. KS. 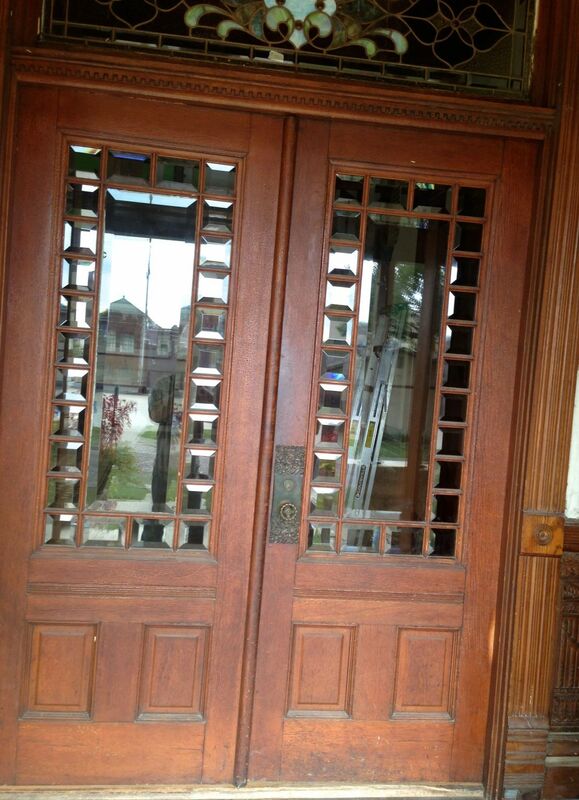 Question please, how can I find an old fixer upper Victorian home for sale as close to K.U. Medical Center in K.C. KS on my own. Without a real estate agent pushing me, pushing me. Thank you. Martha. Are you familiar with Zillow.com? You can select an area, and then customize the search for the age of houses. Zillow will then show you all the Victorian-era houses in the area. LOL, okay Ross the sidebar was very funny! Keep plugging away and you can showcase your home as a museum just as Elvis’s family has his and has made an absolute fortune! I love the steampunk style…I had to look it up to see what it was…and it was AWESOME! Your talent is Phenomenal! I’ve not commented in ages, so decided to start from the very beginning. Knowing you did a post Thanksgiving event last year wonder if it happened this time around? Hopefully winter weather holds off allowing you some time to finish the bare wood faced. Hang in there! P:S Just checked the menu which is delicious ! You’ve been on my mind of late! Yes, it has been a long time! You also tantalized that you might come visit by the end of this year! Hi, Ross — I’m just fighting with WordPress, trying to get you blog back after I changed my address. Love the site; DO NOT want to miss it.